The FPL Vibes Prize League 2015-16 is now open for the upcoming Fantasy Premier League season. 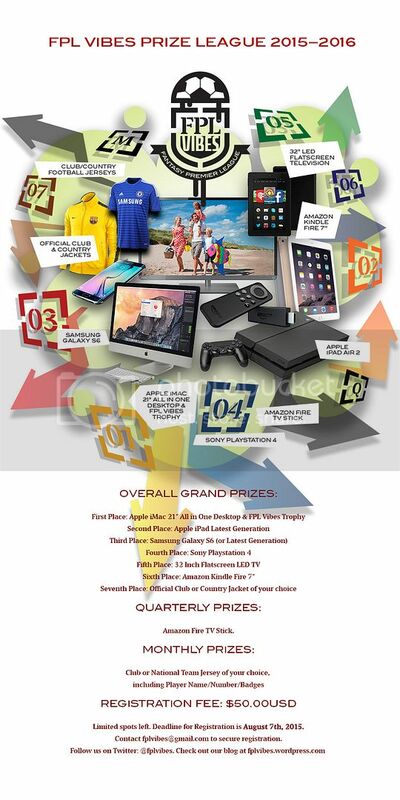 This is the 4th edition of the Prize League and promises to be the biggest and most competitive ever. In addition to the coveted FPL Vibes Trophy, Grand Prizes have been extended to the Top 7 places. For the first time, there are Quarterly Prizes added to the regular Monthly Prizes of an Official Club Jersey of your choice from Red Mango Kits. The 2015-16 Fantasy Premier League Season promises to be more competitive than ever before. The new features added to the FPL game now give managers a unique opportunity to strategically target prizes throughout the season. Sixth Place: Amazon Kindle Fire 7"
Monthly Prizes: Club or Country Jersey of your choice, including Player Name and Number courtesy Red Mango Kits. Only 15 spots left in the league... Deadline is Friday peeps. I know I am late, but it's been a while since I been on here. I f you still taking players, i am willing to join late.